A small range of very fine beer kits from Muntons. It only has three beers in it, Smugglers Special Premium Ale, Old Conkerwood Black Ale and Midas Touch Golden Ale. With these beer kits no corner has been cut and all of them contain 3.6 kg of malt extract producing truly superb ales. 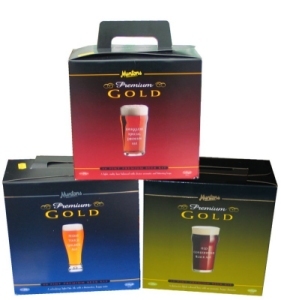 Muntons Premium Gold are the most expensive beer kits on the market and once one has experienced their delight it is not hard to guess why. There is also a another beer kit known as Santa’s Winter Warmer which that is not technically in this range although it also contains 3.6 kg of malt extract and is made by Muntons.